Baroness have premiered a new video for their song “Try To Disappear,” via Juxtapoz.com. This song is from the band’s latest album, “Purple,” which is available now. Baroness have premiered a new video for their song “Shock Me.” This song is from the band’s latest album, Purple, which is available now. Baroness have premiered a new song titled “Morningstar,” via Kerrang!. This song is from the band’s new album, Purple, which will be released on December 18. Baroness have premiered a new song titled “Shock Me.” This song is from the band’s new album, Purple, which will be released on December 18. 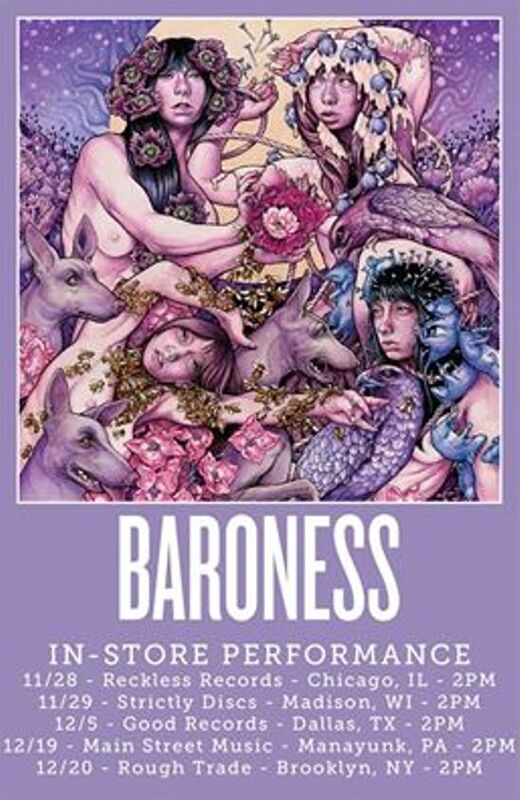 Baroness have announced some in-store performances to promote their new album, Purple, which will be released on December 18. People who preorder the effort get automatic entry, as well as a signed lithograph, featuring the album’s cover art.